Win!! My Favourite Things - Miss C's Nursery Giveaway! Firstly thank you so much for the amazing feedback on Miss C's nursery space. If you missed the posts you can view all of the pictures right here and all of the stockist details and answers to reader questions here. Well folks if you missed the Stockist Post, it is from the amazing Tamsyn at Max and Me Homewears and today I have one up for grabs for one lucky reader (squeal!!). This very divine personalised cushion cover is valued at $65.00 (cushion insert not included) and the super, super lucky reader can choose between the silver sequins (which I have) or the amazing gold. Another one of my very favourite items in Miss C's room, is the super cute sequin hanger created by Natalie over at by Each Day with Jay. We have ours hanging on the front of Miss C's nursery door and for the longest time it was used to display her Christening dress. I now rotate it with tutus and other pretty little outfits - it is very special and far too pretty to hide behind her closet doors! One lucky reader will get to win their choice of hanger in silver, gold, black or pink (subject to availability). Entry is very simple, all you need to do is follow the Rafflecopter prompts below on the widget. Please ensure that you leave a comment below the blog post telling me what you would do with your sequin goodies if you won... All entries/comments must contain your full name next to your comment so that entries can be verified. Pretty please don't forget to do this, as entries with no name will be ineligible to win! Good luck everyone, I know that the fortunate winners will love these beautiful items as much as I do! To inspire our dinning hall! 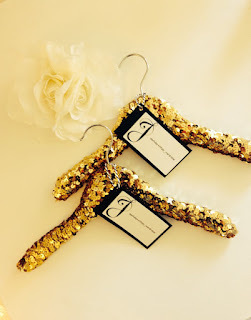 The sequin hangers would look adorable with the lace dresses my twin girls wore at our wedding in March. I am totally in love with the sequin cushion so I think I would have to keep that for my bed (only so there aren't sister fights on who gets it hehe) I have a quilt cover with patches of pink so this would look lovely! With two girls there is no shortage of a dress or tulle skirt in our house! Also love these cushions, but if I win I'll have to purchase another one to make sure they both get one. 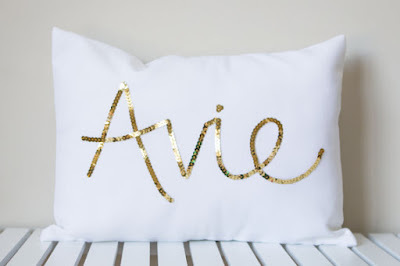 I love all things glitter and gold plus, since I have a son and not a daughter, I'd have the word "sleep" printed in sequins on the pillow as a feature on our bed. I plan on using them for my daughter in her room. Just gorgeous. Glitz and glam fits right in with my daughters 'big girl' room and these gorgeous additions would finish it off perfectly. I'm not sure how to change my user name. Is it ok if I put my full name (Jade Williams) in this comment? That is perfect - thank you! We are about to do some very long awaited and postponed extensions. I would love the hanger to display Gracie's first dress on her door and the cushion will go perfectly in the rocking chair. I plan to use them to make my bedroom sparkle. This coushion cover would look great on my daughters soon to be big girl bed! She would love that it has her name on it! I would display it loudly and proudly in my daughters bedroom! Admire them, enjoy them and show them off! Give them to a friend of mine who is about to have a baby girl. She loves bright sparkly things so these will fit right in! I'd would love these for my little girls room, we have just finished decorating her first big girl room and she loves and treasures anything that sparkles (don't we all!) I can just imagine the cushion on her bed or the hanger displaying her ballet tutu! Fingers crossed!!! I'd be marking my territory with my side of the bed, no kids, no hubby, except for cuddles and maybe a kiss or a peck! I know everyone probably says this - but those cushions are utterly fabulous!! my daughter is expecting her first baby and I'm so excited and blessed. I would love one with 'Baby' on it. What a lovely keepsake and idea. Luv to give these to my sis for Chrissy, they are awesome. I am in the process of decorating my daughters room, and think the cushion would look amazing on her bed and the hanger would be perfect for her daily outfit choice hanging near her door. I'd love to display this at the front entrance of our home, a glitter gold cushion is a story to be told. for my niece, is the perfect gift given with much thought! My little 2 year old is about to move out of the nursery to make room for her little brother. These would be perfect in her new big girl bedroom. Less is more, a touch of class with a personal touch. Perfect for when my tin girl fetcher own room finally! Not long now! All girls need a little bling! Need to proof read that! Twin girl finally gets her own room I mean! The personalised cushion is so cute. I would love to give these to my friend who is due with her first born any day now! They're an awesome addition to any nursery!